When it's time to care for your lawn, sometimes the simple tasks achieve the best results. Before getting caught up in exotic plants and trees to care for, what do you have planned for the nutrition of your lawn? 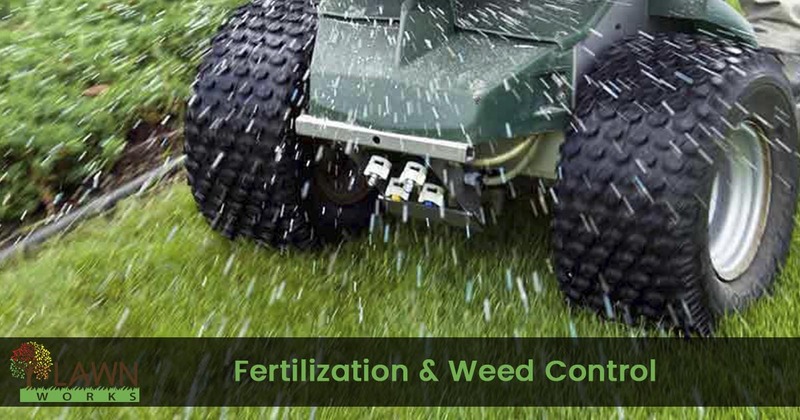 Many homeowners view fertilization as a product that gets applied once or twice each year. However, just as you would want to nourish a child or a pet properly, your lawn and landscape deserve the right balanced feeding regimen for their best results. Professional landscaping professionals, like the team at Lawn Works, properly nourish the soil to promote a great looking yard. Not only will this set your yard up for success, but it may ward off common diseases and problems facing the turf. In fact, when planting new grass, the sod will burn out almost immediately if the soil’s pH levels aren’t balanced first. The same goes for most plants, although flowers and some trees may be able to adapt. It doesn’t help that some plants require higher levels of pH, while others need next to none. It’s also harrowing to know that it’s often not until several days later that symptoms of wrong nutrients are present, and by then it may be too late! Another item of note is weed control. Whether your yard has been around for years or you’re starting from scratch, weeds can make it difficult to keep your lawn alive. There are numerous varieties of lawn weeds, and some are surprisingly hearty. You can’t just start covering your entire outside area with vegetation killers. Many weed killers and controlling substances are powerful enough to harm the grass you wish to keep. If you use a total vegetation killer and you are careful not to get it on the grass, it can seep down into the ground, poisoning everything else later. That is why we always recommend leaving your yard upkeep to the pros. When you hire us, we ensure that your yard is getting only the best care possible. Depending on the type of grass that you have, along with the current weather and season, will dictate what nutrients are required. Weed control, on the other hand, should be handled by someone with experience and an eye for detail. By carefully removing weeds, either with industrial strength sprays or pulling them out by hand, we can ensure your yard looks its best for longer. Cheap products from retail stores may wind up doing more harm than good. In fact, you may find that your weeds survive while everything else gets poisoned! Most homeowners don’t test the effects that their yard chemicals have on their soil composition. As a result, you may finally get your dirt balanced, only to have that weed spray make a mess of it! Instead, you should call the expert choice in local yard care services. We offer superior fertilization and weed control services, helping you save on better landscaping every time. If you’re running yourself ragged trying to care for your yard correctly, then let us assist you. We continue to fight against weeds better than any other product or service available. Call today to schedule your best fertilization and weed control services, as well as abroad range of residential lawn care choices. We strive to help more area homeowners have a better yard each day. We offer experienced professionals and commercial grade products, giving you the yard you deserve. Call our company now for your best yard care professionals!